Our test Mazda CX-5 compact-ute presented itself for driving review in a very handsome navy blue color with light ecru leather seating. Our top-of-the-line Grand Touring model came well-equipped. 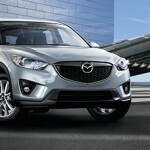 The CX-5 is available in six styles, theÂ Sport version (AWD and FWD), Touring (AWD, FWD), and Grand Touring (AWD, FWD). Pricing ranges from $21,395 to $29,070. Introduced in 2013, the Mazda CX-5 is a great looking CUV, somewhat resembling the high-end BMW SUVâ€™s.Â This writer had several favorable comments from onlookers, and lots of questions. Hopefully, it will generate a few walk-ins at local dealers. While there is much to like about the CX-5, we didnâ€™t care for the four-banger sound of the 4-cylinder engine; the exhaust hums a strange tune, too, and we suspect sounds great to some. Around town driving makes the 2.5-liter acceptable, but when hitting the highway, itâ€™s woefully, limited. 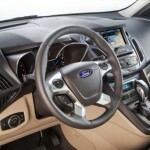 Fuel economy is acceptable and the cabin is outfitted nicely. As with other CUVâ€™s, the Mazda CX-5 has a firm ride; One of the things that didnâ€™t appeal to this writer about the Kia Sportage and Hyundai Tucson. However, there are so many other things about these compact utes that are appealing, maybe a firmer ride can be overlooked. Options on our test CX-5 included cargo mat ($60), rear bumper guard ($100), door sill trim plates ($125), Grand Touring Tech Package (navigation system, tire pressure monitoring system, HID headlamps w/auto leveling, adaptive front lighting, smart city brake support, auto dim mirror with HomeLink, $1,425). One unnerving feature is the CX-5â€™s skitishness on the road. We didnâ€™t get the feeling it would turn over, but it felt somewhat unsure on some roads. In addition, when backing up and moving the gearshift into drive, the CX-5 shifted and jerked, the vehicle leaping forward. Not sure if this was a problem with the transmission on this particular test vehicle, or a function of how it operates in general. The CX-5â€™s touch screen is quite small, in comparison. Again, one cannot expect the quality or sophistication of those items commonly found on luxury sport-utes. For the money and carâ€™s category, these are adequate. Mazdaâ€™s Tom Tom based navigation is easy to use, as are the audio system and climate control. Mazda vehicles are generally a favorite of this writer, particularly the MX-5 Miata. 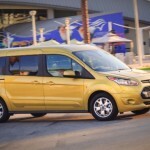 Styling and features are often on the receiving end of complimentary comments, for styling, comfort, fuel economy. Competition for the CX-5 includes Toyota RAV4, Ford Escape, Nissan Rogue, Subaru Forester and Honda CR-V. All strong competitors. EPA fuel economy: 24/30 mpg. Fuel Tank Capacity: 15.3 gal. Warranty: 36-mth/36,000-mile bumper-to-bumper, 60-mth/60,000-mile powertrain, 24-hour roadside assistance. A reliable standby in the Lexus stable, the ES 350 has been a very popular sedan. For 2014, there are a few changes, including the available high-intensity discharge headlamps now accompanied by LED fog lights. Buyers can also opt for the Bamboo interior trim (also available in the hybrid version), as well as heated/ventilated seats with leather interior. Also new is the Siri Eyes Free Mode for the iPhone 4S and 5. enabling various voice commands (placing calls, playing iTunes music, texting, emails, getting directions, calendar, listening to notifications, performing a search, appts., etc). The 350 ES is available in only one iteration, unlike other luxury sedans that offer a longer version. 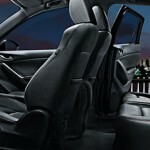 There is plenty of rear seating room in the ES and passengers can expect a comfortable ride over the long haul. In fact, the ES sports more legroom at 40 inches than its big sisters the LS at 35.8 inches and the GS at 36.8 inches. Driverâ€™s seating, however, isnâ€™t as comfortable; nor is it as supportive as some of its competitors. Our test version came equipped (below) with the optional Luxury Package which includes the beautiful Bamboo trim and heated/cooled leather seating. For the most part, the ESâ€™ interior is â€œluxurious,â€ but nothing outstanding. As in the LS, the ES uses the mouse-like controller to operate the sound system and navigation. While we have become accustomed to using it, it is somewhat clumsy. 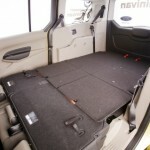 Trunk space is plentiful at 15.2 inches and easily reachable when loading. 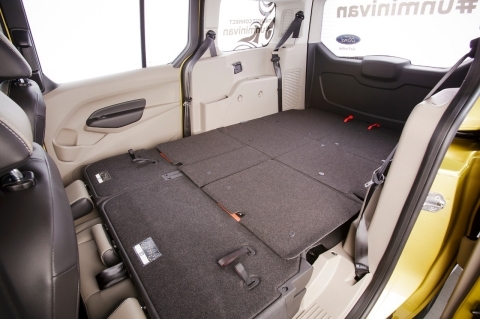 A small pass-through is the only connection to the trunk as the rear seats in the ES do not fold flat. This is a disadvantage. The Mercury MKZâ€™s seat does fold down, however, another competitor, the Hyundai Genesis does not. Extra space is limited in the ES 350. 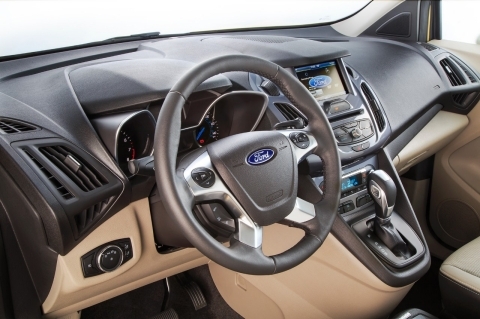 There are map pockets on the door and a center console that provides space to hid things. But in general, this is not a generous interior. Cupholders are at a premium, too. Maybe Lexus is thinking â€œwhy would anyone want to be eating or drinking in this luxo-sedan?â€ I can remember the days that was true of this writer. No one was allowed to even entertain any spills in my ride! My, how things have changed. The optional equipment on our test ES 350 included Blind Spot Monitor w/rear cross traffic alert ($500); High Intensity Discharge (HID) Headlamps w/LED Daytime Running Lights ($565); Power Rear Sunshade ($210); Luxury Package (perforated leather-trimmed interior, heated/ventilated front seats, Bamboo interior trim, Power tilt/telescopic steering wheel,Lexus Memory Systemfor driverâ€™s seat, outside mirrors, steering wheel, Remote keyless entry-linked memory ($1,370); Hard Disk Drive Navigation system with backup camera, 8-inchVGA screen, voice command, single CD/DVD player, Lexus Enform w/destination assist and eDestination, subscription-free App Suite ($2,625); Intuitive Parking Assist ($500), Rain Sensing Wipers with deicer ($155), Wood and leather Trimed steering wheel ($300). Competitors to the ES 350 currently include Hyundai Azera and Genesis, Volvo S60, Lincoln MKZ, Acura TL, and in the not to distance past, the Infiniti Q50 (G37) and the Audi A4. While the Lexus ES 350 sedan remains a great car, there are so many more sedans on the market today. Not necessarily in the â€˜near luxuryâ€™ category but strong contenders, nevertheless: Including such cars as the Kia Optima. We didnâ€™t find the ES 350 as comfortable a car as some as it hovered over ruts and bumps. Bottoming out when navigating a speed bump at low speeds surprised us. Maybe because we just got out of a week in the Lexus LS. Hardly a comparison, I suppose. Some believe that the ES 350 offers a lot for the $43,605 price tag. This writer would argue, which near luxury sedan doesnâ€™t? True, the ES 350 offers roomy rear seating and a fair amount of luxury on the inside. Styling, although somewhat changed for 2014, is still dated. What was once available at between $30,000-$35,000 in the â€˜near luxuryâ€™ category, is now priced at between $40,000-$45,000. The ES 350 added additional space when it switched to the Toyota Avalon platform in 2013. If you prefer a sportier car, Lexus offers the IS (only $520 more than the ES). For those who want additional size and bulk, the GS fits that bill, at some $10,000 dollars more. As with all Lexus offerings, the ES 350 drives effortlessly. Itâ€™s clear why so many consumers elect to drive the ES. Itâ€™s an easy car to drive every day. 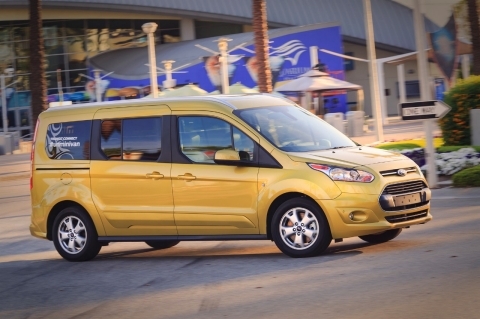 Parking, maneuvering and handling accommodate most driving needs. Somewhat dull for those of us who prefer a performance car feel, the ES still canâ€™t be faulted for all it offers the average driver. When driving at highway speeds, the ES isnâ€™t perfectly soundproof. As noted above, the ES was surprisingly harsh over bumps and less desirable road surfaces. No complaints about Lexusâ€™ 3.5-liter engine, the same engine in many of Lexusâ€™ vehicles. This is a very capable, quiet and powerful-enough engine. Front-wheel-drive, teamed with traction control and vehicle stability control makes for good handling during the winter months. As expected, safety features abound on the ES. In fact, in 2014, the ES earned the National Highway Safety Administrationâ€™s highest overall crash test rating. EPA fuel economy: 21/31/24 mpg. Warranty: 4 yr/50,000-mile basic coverage, 6-yr/70,000-mile powertrain coverage, 6 yr/unlimited mile corrosion perforation. Have a Hankering for a Cup Cake? Indianapolisâ€™ original cupcake bakery, these adorably decorated shops brought delectable cupcakes to Hoosiers. 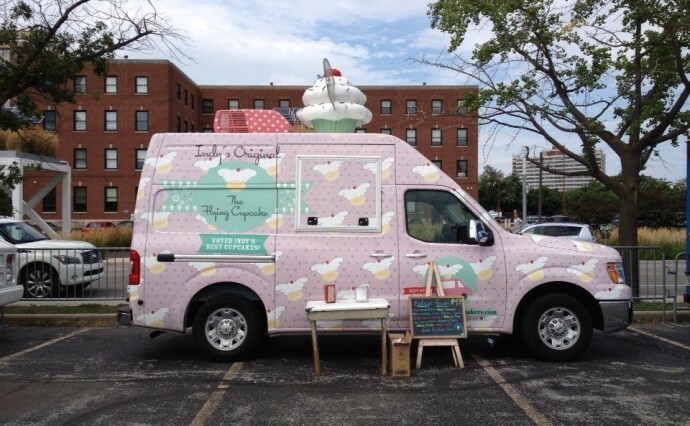 With four Indianapolis locations and two affectionately named cupcake trucks, Petunia and Penelope, you are never far from a delicious cupcake. Check their Facebook for a list of each dayâ€™s and locationâ€™s flavors. The official cupcake of the Indianapolis Indians for 2014, Gigiâ€™s Cupcakes has been bringing tasty cupcakes to Indianapolis since 2010. 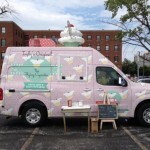 Check out their Facebook for the dayâ€™s flavors or follow Pinky, their cupcake truck, on Twitter for daily whereabouts. Open since 2010, Kimâ€™s slogan, â€œSave a vegetableâ€¦Eat a cupcake!â€ has inspired Hoosiers to try delicious baked delights in 60 flavors. Like their Facebook for daily flavor selections. This family-owned and -operated shop really is run by two sisters, Nicole McClure and Laura Bowen. The sisters firmly believe that if you are what you eat, you should eat something cute. Be sure to check out the pictures of their cupcakes on their Facebook. From simple and delicious vanilla cupcakes to kid-friendly banana and peanut butter to sophisticated mojito and lime mint, this gourmet cupcake shop has a flavor for everyone. Like their Facebook for daily menu updates. The motto for this French-inspired cupcake shop: Life is too short to not eat dessert first. Their cupcakes are made from scratch every morning. A sweet cottage will serve as the perfect place to indulge in these delights as soon as it is finished being remodeled. Peruse their Facebook to see what theyâ€™re baking today. The sweetest home in town, the owners of this shop are delighted to create your favorite cupcakes. Although this cozy shop is temporarily closed for renovations, they will be back to baking soon. Stay tuned to Facebook for updates about when the shop will open again and for daily flavor selections.